Following the practices and procedures of gas grill safety helps keep you and your loved ones safe from burns and injuries. Taking the time to make sure your grill is in top working condition and following simple gas grilling tips could mean the difference between spending an enjoyable time with your family and friends or being rushed to the emergency room. For many people part of the fun of warmer weather is cooking outdoors. Enjoying relaxing family meals at the end of the workday and backyard barbecues with friends and family are times of happiness and laughter. Help make sure your summer stays filled with good times by following these safety tips for operating and cooking on your gas grill. Do not use a propane tank that is rusted, dented or damaged in any way. Do not overfill your propane tank. Tanks should only be filled to 80 percent of their capacity. The propane needs room to expand. Do not smoke in the area near a propane tank. Never store a propane tank for your grill indoors. If you store your grill indoors, disconnect the tank and keep it outside in an upright position. Do not store or leave a propane tank in your vehicle for an extended period of time. Do not store or leave a propane tank in a location where it will be exposed to high temperatures, including near the grill. Before you use your grill for the first time each season, check it carefully for any gas leaks following the manufacturer's directions for your specific gas grill. Check for blockages caused by old food grease, spiders or insects and look for brittleness, holes or sharp bends in the hoses. Never use a gas grill indoors or in any enclosed area. They should only be used outside in areas that are well ventilated. Place your gas grill on a stable, flat surface. It should not be placed underneath low-hanging branches or any roofed area. Always check to make sure the cylinder valve and all of the controls for the grill burners are turned off when the grill is not in use. Never put a cover on a grill that has not completely cooled off. Once your grill is cooled off, place small plastic bags over the air intakes of the burners and the fittings on the ends of the hose to keep out water, dirt, spiders and insects. If you smell gas, turn off the gas supply immediately. Always keep children away from propane tanks and gas grills. Make sure all controls are in the "Off" position. Turn the valve on the cylinder one turn. Check the gas connection with a solution of 50 percent liquid soap and 50 percent water by brushing the solution onto the connections. If any soap bubbles appear, it means there is a gas is leaking from the connection. Repeat the process to check for gas leaks. If there are no longer any bubbles, the connection is no longer leaking. If there are still bubbles appearing, turn of the gas and do not use the propane tank or the grill. If possible, try checking for gas leakage using another propane tank. If soap bubbles still appear, the problem may be with the connection to the grill. Always keep children away from a grill that is in use. Open the gas valve only a half turn when you are grilling to make it easy to turn of the gas supply in an emergency. A half turn provides plenty of gas for cooking. 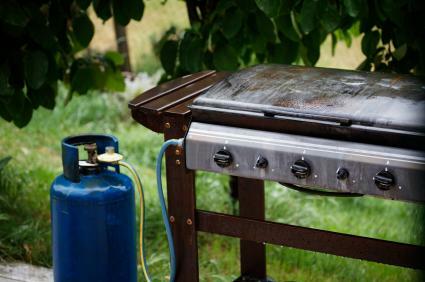 To prevent a flash fire from any built-up gas inside the grill, always light it with the lid open. Never lean over a grill when you are cooking or lighting a burner. Never leave a gas grill unattended while in use. Never move a grill that is in use or is still hot. Never use an aerosol can close to a lit grill. Many aerosol products are flammable. Use grilling utensils with long handles to stay safe from burns. Never wear loose, baggy clothes when you are cooking outdoors. Wear an apron made of material that is nonflammable. Fill your summer with delicious grilled food, lots of outdoor fun and memorable good times with family and friends. By following proper safety practices and procedures for using a gas grill, you can be confident that you'll have a safe and enjoyable outdoor grilling season.